Nigeria’s former president, Olusegun Obasanjo, took some time off his busy schedule to speak to a PREMIUM TIMES team at his Abeokuta home about some of the issues he wrote about in his book, “My Watch”. Below is excerpt of the first part of the interview. PT: Thank you sir for granting us this opportunity to talk about your book. Some people say it is selling like hot cake, I don’t know if it is true but that’s what people say. How has it been? What has been the financial reward from there? Obasanjo: The book was not written for financial reward. If it was written for financial reward, now that…what do you call him… Kashamu had done the stupid things he did, I would have sued him‎ for damages and I would have got damages. But that’s not what the book was written for. The book was written for my experience, my understanding, my knowledge, and what you may call wisdom as a result of all these, to put it for others to be able to learn or acquire knowledge. That’s one. Two, it was also written to set the record right. One of the things that people don’t know, people that I call arm chair presidents is that they don’t know what goes in before decisions are made or what the man making decisions, what leads him to making decisions. Take for instance the decision on privatising all refineries. I explained that what I met were refineries that were not working, refineries that were given to an amateur for repairs, for maintenance, what they call turn around maintenance to the company of Emeka Offor – Chrome Group. Where has Emeka Offor maintained refineries before? Where has he? That’s what we met. So the refineries were not working. I called Shell. I said ‘come and help us, just run the refinery.’ Shell was frank with me. It said that ‘we make our money from upstream, downstream is more of a service. Two, your refineries are small. Port Harcourt is 60,000 barrels a day. Refineries now go 300,000 barrels a day. Three, your refineries have not been maintained well. Four, we don’t want to go into the corruption that is entailed in all these’. I said ‘ok, come and help me run it’. They refused. Now when I then saw people who agreed to take 51 percent equity in two of the refineries; they did not promise to pay, they paid 750 million, I was dancing and I said ‘look, this is God sent.’ My successor came (and) they cancelled it and paid them the money back. Those refineries today – you won’t get them because they’ve become scrap. PT: You mentioned Emeka Offor. There were lots of stories about the refineries you met, how you handled it. But you never recovered anything from Emeka Offor. 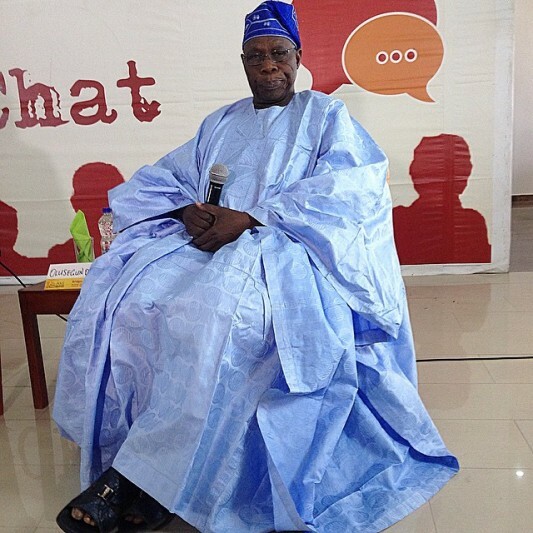 Obasanjo: What can you recover? A man ‎who was paid upfront. He had people. He got some police…people were there. And like they have said to you now, look, if it works for a week, that’s all you get. And Emeka Offor, after I left he became friends with every government that has come. Now he’s not only into refinery and oil and all that, he’s now also in energy. PT: Something came out of your book. You said that before you were elected, that the feeling and perception was that only a northerner ‎could be elected in Nigeria. How did you feel breaking that myth, because you called it a myth in your book? PT: (Cuts in) I was thinking that (1993) was when the myth was broken. Obasanjo: Election which result has not been declared, you cannot talk of… It doesn’t matter what you may see but until the election result is formally declared, it could be anything. PT: So you think that period was a very momentous period in Nigeria’s history? Obasanjo: I think it was good for Nigeria. It was one of the great strides that Nigeria made. Just as I believe that Jonathan winning election in 2011 was also a great stride for us or 2015, now that the incumbent was defeated by the opposition. These are landmarks, or if you like, reference points in our advancement in democracy. PT: In the Volume 2 of your book, you wrote extensively about the role God used you to play in enthroning Yar’Adua and Jonathan. You also admitted later – extensive analysis – how both leaders performed poorly. There are those who believe that you owe Nigerians an apology for leading them to enthrone non-performing leaders. Obasanjo: (Cuts in) You are absolutely wrong Now you voted for them. I didn’t just take them and put them there. And they went through a process. Don’t you know that? Do you know or don’t you know that they went through a process? Do you know or don’t you know? Answer (slaps interviewer’s thigh vigorously). Obasanjo: Okay. They went through a process. And that is the process that the constitution and the electoral system allow. PT: In other words, are you saying that all of us are guilty? Obasanjo: Of course. If you want to put that, everybody who voted for them is guilty. PT: But you know people believed you. People believed you. When you speak…. Obasanjo: (Cuts in) When I speak, I am not an oracle. And I’m not infallible. But on this particular one I have said to all of you, you can get a job for a man you cannot do it for him. Even your own son if you put him in a job…. There is a good saying that if you want to know how anybody will perform, put him in position of power or put money into his hand. Obasanjo: (Cuts in) No. You are wrong. There’s no due diligence that you can do to allow a man…. You cannot know the quality of a gift from the wrapping. You don’t know that, you will never go anywhere (slaps interviewer’s thigh). That is absolute wrong. Obasanjo: (Cuts in) No no no. Adekunle was there before me. So he didn’t know Adekunle had the capacity? Answer me. In that same Division, Adekunle was there. And if Adekunle had remained there, there’s the possibility that Nigeria could have lost the war. So will you blame him for that? PT: We won’t. But you know a lot of people believe that between 1999 and 2007 when you left was a time that a lot changed in Nigeria for the better. And people just keep saying that you destroyed everything that you put in place with the successors you enthroned. Obasanjo: But take Ngozi (Okonjo-Iweala), who worked for me. And who worked competently for me. Because I know Ngozi’s weaknesses, but I know her strong points. Her strong point is technical competence. But Ngozi needs to be led and to be supervised. Now will you comment on Ngozi who worked for me as the same Ngozi who worked for Jonathan? Will you? But it’s the same person. PT: At what point do you think she derailed if I may use that word? PT: Is it at the point that you changed her – because you removed her as finance minister. Was it at that point that she began to derail? Obasanjo: She derailed because….when Jonathan even said he wanted her, I said ‘I hope you can manage her.’ And Ngozi herself sent me a text (and) I told her times have changed. PT: But why did you change her? She was managing the economy very well for you. Why did you now remove her suddenly? Obasanjo: I wrote it in that my book. PT: It didn’t come out clearly enough? Obasanjo:It must have come out. Maybe you haven’t read the book very well. I said I’ve touched reform. I’ve touched almost everywhere except Ministry of Education and Ministry of Foreign Affairs. So one day, I was in my office and the Head of Service, Yayale (Ahmed), came in. He said ‘look, you are looking not happy, what is the matter?’ I said I am worried about two ministries and the ministers who can do the work I wanted to be done there in these two ministries are already doing good work where they are. And he said ‘talk let me see.’ I said education and foreign affairs. And he said ‘who are the ministers that you think can do the job.’ I said Oby (Ezekwesili), Ngozi, and El-Rufai. He said ‘what is Oby doing for you now?’ I said Oby is doing Solid Minerals. He said ‘Sir, in all sincerity, I know you don’t like to rank ministries, but will you say Ministry of Solid Minerals is as important as Ministry of Education.’ I said yes I don’t rank ministries, they are all important. He said, ‘Can’t you take any of these three to do education and then get somebody else to do solid minerals?’ So I took Oby there. Now in the Ministry of Finance we had got debt relief, so I could afford to take Ngozi to Foreign Affairs. That’s all. And then she had Nenadi (Usman) who was the minister of state. She’s not a buffoon. And then, which is also part of her weakness, she came to me and said, look, since it’s Ministry of Foreign Affairs, she will like to take International Finance along with it. I said talk to your sister with whom you are working and I don’t see anything wrong with that provided you work out a relationship. But she didn’t accord Nenadi the recognition and the consideration that was necessary. I then said the ministry of International finance should go back to Finance and that happened. She said she couldn’t act. She put in a letter of resignation. And she had done that before, and before she could come and get people to come and beg, I announced acceptance (of her resignation). PT: She once resigned before and she took it back? Obasanjo: No no no. I know her character. PT: So why did she resign the first time? Obasanjo: She just felt if she cannot have her way, with me…. If I am the one in charge, then it has to be what I see as what is the best interest of the nation. PT: So even when she resigned, if you didn’t announce the acceptance she would have come back. So all efforts to make her come back didn’t work? Obasanjo: No no no. Because I had announced. Obasanjo: (Cuts in) I said that. PT: Yes, you said that. And many even said he helped fund your campaign at the time. PT: You didn’t say that. You said he supported you. But in your book, you spoke of how in 2011, you chose to support Jonathan…..because you called a South West PDP meeting where Jonathan was endorsed, even when IBB had also indicated interest in running. Why did you prefer to act that way? Obasanjo: That’s not…What nonsense is that? Because you backed me I must back you? It doesn’t matter who you are? And I don’t have consideration for Nigeria? It’s consideration that you backed me? No, if that is the way you think then you are short-sighted and myopic and stupid. And put that one. No Nigerian should think that way. You backed me? And if you don’t back me others will back me. So everybody who backed me that time, I must now come and say, look, when you want anything, any office…. I don’t act like that. PT: It means that you were able to break the jinx of the problem of minority. Obasanjo: It is necessary that we deal with that. PT: You said something very shocking in your book – that the presidency instructed EFCC to remove a vital document in Gbenga Daniel’s file in their custody as a way of getting the former governor off their hook. Obasanjo: No. The president knows about it but it was his chief of staff who gave the instruction. PT: With the consent of the then president? Obasanjo: The president knows about it. PT: Now listen to what you wrote in page 81 of your book. “To fight corruption, the leader needs absolute transparency, no skeleton in the cupboard, clean hands, a clear mind, fear of God, and absolute honesty and integrity, submission to scrupulous investigation. Search and enquiries are also good for a leader who wants to lead by example.” Great message for any leader all over the world! This is prescriptive. Now what do you say to those who keep linking you with corruption during your own tenure, especially the unresolved Halliburton scam for which some of your aides were arrested? Obasanjo: Look, anybody can make any allegation. Go and read the EFCC report on me. I’m the only leader who has left office who has had, I said they should carry out clinical… did you see that in the book? And if you haven’t seen that in the book then you haven’t read the book. So what else do you want? (Ndudi) Elumelu carried out a report. Did you see the report of the House and the action of the House? What more do you want? So it doesn’t matter the allegation you make, that’s entirely up to you. Halliburton, Bodunde (one of his aides) has been taken to court twice and the court has dismissed the case. What more do you want? The latest was the one Jonathan did. Just before he left, he took Bodunde back to court. He was discharged and the case dismissed the first time. The second time Jonathan took him to court and he was discharged again. So what do you want? PT: You may not know about it, you may not have a hand in it, but it does appear, especially from reports from US investigators that some officials of your administration perhaps took bribe from Halliburton. Obasanjo: No no no! I don’t deny that. But not me! I don’t deny their reports about Halliburton but not me. I don’t even know what Halliburton was doing here. So what’s your problem? And EFCC looked into it. You read the report of EFCC bordering on Halliburton. PT: The only gap is that people are wondering why you didn’t take steps to bring those officials of your regime to book. Obasanjo: (Cuts in) There’s no gap. You can make any allegation. Now EFCC – you can count number of people who are taken to court. I don’t take anybody to court, Mojeed. And don’t annoy me. Now you have the system that takes them to court. I don’t take anybody to court. Because if I have to be the one to say ‘take this one to court,’ that will be witch- hunting. That’s not my job. My job is – set up the system and if anybody in that system is not performing then look for somebody to perform. So it doesn’t matter what allegation. If you read that report of EFCC, one man was hired, and he went out with all sorts of spurious allegations and EFCC took it one by one. Even Ribadu told me that when he gave that report, because he didn’t give the report to me…I said, look, carry out a critical investigation. I thought that was good. Then when he wrote his report, he gave it to Yar’Adua. And he said Yar’Adua asked him, ‘You can’t find anything at all?’ He brought Metropolitan Police here and he said whenever they are doing investigation in the past, when they get somewhere they will say ‘oh, yes, some people are interested.’ But this is the first time they had free hand to carry out investigation. So what more do you want? And what I put there is what I believe in. Has anybody working under me said to you that ‘oh, he asked me to take bribe?